If you’ve followed my blog much, you’ll know how much importance I put on the first line. Just as important, and just as tricky, is the final line. If I could make one observation from my years as a literary editor, I’d say that the best fiction has a great opening and a great conclusion. Like any great rock-and-roll act will tell you, the most memorable shows are the ones with killer first and long songs. This is not to say that the middle of your fiction can be sloppy, but, as an editor, if I see a strong opening and a strong conclusion, I’m more willing to overlook the shortcomings of the middle. The American Book Review put up a list of their 100 best lines from novels, which you can see here. You can learn a lot just by reading them. And, if you’ve read the novels they go with, you’ll know what it is that makes them good. Here are a few commonalities I’ve seen among them. 1. Resolve the central tension: In the context of a novel, the central tension is usually resolved before the final line, but in some cases it’s not. If you can take the central tension of the novel (or a smaller, sub-tension) through to the final line, your readers will stay with you. Just remember to resolve enough smaller conflicts along the way, so the reader will trust you with the larger conflicts. 2. Leave some tension unresolved: The expectation of most readers is that every tension will be resolved by the final line. But, at times, you can defy that expectation and allow the tension to live on. This is a more “literary” type of ending, but it still has it’s merits. Cormac McCarthy does this often, and does it well. We get a resolve, though it may not be the one we’re hoping for. I like to think that the best final lines lead us toward a particular conclusion, without having to spell out exactly how the story resolves. That way, the tension is still alive, and the story can live beyond it’s pages. 3. Transcend the story from the confines of the novel: Many novels center around a universal struggle—Good v. Evil, Love v. Jealousy, etc. These are struggles that will persist beyond our characters’ lives, beyond the pages of our novel. Ending in such a way that the story concludes, and the central tension is resolved, is fantastic. But if you can take the next step and indicate a larger, universal struggle, of which your characters’ conflicts are only microcosms, then you can elevate your story beyond a simple tale, and into something larger, something that persists for ages to come. 4. 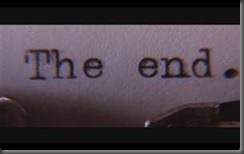 Enlighten the preceding prose: Poe talks a bit about the last line of a poem or short story as a light that, when shined back on the rest of the story, illuminates it in such a way that the reader thinks, “How did I not see this coming?” I think back to The Sixth Sense. At the end of the film, when we realize Bruce Willis is dead, we feel cheated, as if we were lied to. But, when we go back and look at the film with the new information, it becomes clear that we’ve made some assumptions that were not warranted. Watching the film again, we see the clues that we should have picked up on the first time. This is a simple tool called foreshadowing. When done properly, it will give us an indication of how the story may end, without us understanding EXACTLY how it will conclude. This is far from a comprehensive list, but it’s a good beginning. Perhaps these suggestions will help you formulate the final pages of your story. Good writing. To be honest, I have problems even with the last line of a chapter, I want to keep the action going, but at the same time resolve a little bit just to make sure the reader stays interested. Or sometimes I just make the conflict all the more dire as the climax draws near; it kind of depends on the story. One thing I’ve noticed about some of the most satisfying last lines I’ve read is that they feel like it’s the natural thing that would happen, and that the story could well end there without needing a sequel. Like I said in a previous response to these blog posts, the end of the story is kind of like a treasure chest, and the details and the rest of the story are the sand covering it. The reader has worked their way through all that sand–don’t they deserve the treasure of a good ending? Otherwise, it’s like getting all the way to that battered old chest and opening it, only to find that the so-called legendary treasure is a smelly old boot with a gaping plot hole in it. Don’t do that to your reader. Instead, give them a brilliant last line that leaves them raving about the story and recommending it to everyone they know. Definitely some key advice Gansky, but when I look back I realize I must have re-written my first and ending lines a thousand times over. When one writes first or ending lines, for my case at least, I think they should finish their work first and then go back to capture all the experience in the book. It definitely takes a lot of love and nurture to produce a beautiful thing. It takes me so much time to write the first and last lines of story, the first line has to be really good so that the read can be interested in the book and want to keep reading. The last line has to be just as great as the first line. Its kind of a hard thing to accomplish. The main thing I aim for when writing any last line weather it be a story or poem I try to make the reader always remember not just the story, but also that one line. I have to say, sometimes it can be way more of a challange, and it can take me a really long time, but when I read that last line to myself and even I’m in aw, then I know it was worth it. Sometimes it’s hard to catch the readers interest when it comes to writing the last lines because I want to make sure it’s something that makes people say, “Hey, this sounds interesting!” I try to do the best I can when it comes to that. When writing the first line, I want to make sure that it’s something that will fit in the story first before I think of having it as my first line. If it doesn’t fit than It will be off topic and people would be thinking, what is this? I like creating some tension too to get people curious. As a matter of fact, that is my goal.